The moment you contact Swiss America, our team of trained professionals stand ready to serve you. Everyone at Swiss America, from our account executives to our support staff, plays a vital role in ensuring your Swiss America experience is a pleasant one. What do Americans want most from their investments today? "Safety, liquidity, quality, reliability, and profit potential" are what clients tell me. U.S. gold and silver coins offer all these attributes, and more. Why then is the public still hesitant in buying U.S. gold coins today? I suspect that market values are changing so quickly that many have lost their perspective of the fundamentals. But not everyone. 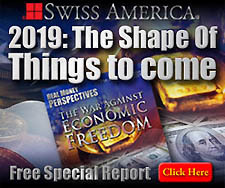 Since 1982, Swiss America has advised clients to diversify at least a small portion of their assets into U.S. gold and silver coins for these four reasons: 1) Liquidity, 2) Safety, 3) Profit Potential, 4) Privacy of Ownership ...in that order. Over the years, our clients tell us how thankful they are to have acquired tangible assets along with a greater market understanding via our educational resources and knowledgeable account executives. Gold coins represent a timeless store of value in a world of declining paper currencies. Tens of thousands of Swiss America clients have followed the 'Swiss Diversification Strategy' over the years. I'm proud of our record. I encourage you to see what our clients have to say about us -- because they are the reason why we're here. We look forward to serving you!